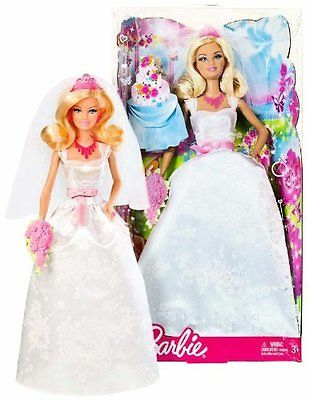 Barbie Royal Bride Doll: Girls can recreate fairytale moments or play out their own wedding-day dreams with this beautiful bride. Her sweet white gown is accented with enchanting touches of glitter, lace and pink to create the perfect look to begin her happily ever after. Carrying a bouquet of pink flowers and accessorized with charming accessories, this bride will captivate as she walks down the aisle. Includes tiara, necklace and bouquet.